This is a well made, yet wonderfully cheesy reproduction 70s shirt. In person the shirt looks really nice, but it's extreme shine makes it flashy and loud. The stripes posses nice deep hues in copper, gold, black, slate blue, black, white and maroon. The colors of the stripes are distinct. 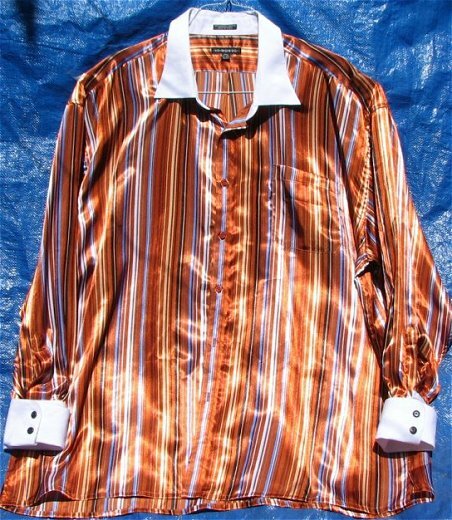 The generously sized shirt has a white collar and white cuffs that are adjustable in length. The lightweight, yet washable shirt says it's a 3x, but I think it may be larger. It can comfortably fit a 58" chest. It says the neck is 19 - 19.5. The adjustable sleeve length is 35 - 37 inches. The shiny and vibrantly colored fabric make it perfect for a 70s theme party. It is perfectly clean. I hand washed it. It can machine washed on gentle. Hand washing extends the life of the garment.